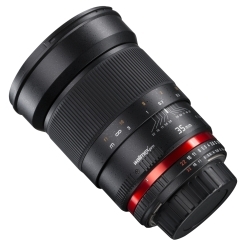 The Walimex pro 35/1.4 lens is the ideal focal length for shooting reports at all times. 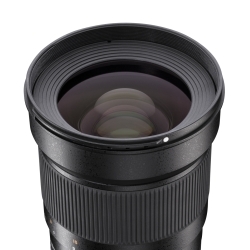 In combination with an 85mm you have always the right combination: overview and detail. The outstanding advantage of the 35mm lies in its freedom from distortion: it brings more image to the sensor, but the wide-angle distortion or receding perspective does not occur yet. 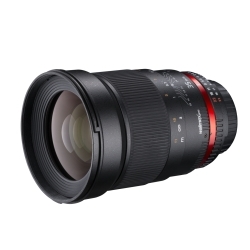 The very high aperture of f/1.4 allows a reserve of up to 3 shutter speeds compared to a standard vario lens. The light intensity is also noticeable in the brightness of the viewfinder, which provides adjustment reliability. The very low depth of field when the aperture is open makes it easier to set the sharpness at certain points. 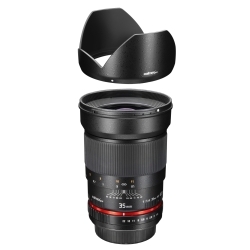 The lens is equipped with an internal focusing system. Lens groups are only shifted within the housing when focusing, so the overall length of the lens does not change, nor does the front mount rotate when focusing. Thus, gradient and polarization filters can be easily applied (size 77mm). 12 lens elements in 10 groups testify to an enormous effort to obtain a powerful, very good lens. One aspherical lens (ASP) is built in, 2 others consist of high refractive glasses (HR). In spite of the average image angle, there are hardly any aberrations visible even at full aperture. Save time in post-processing. A variety of lens defects such as distortion, edge blur, or vignetting appear on the outside of the image. If you use a full-frame lens on a camera with an APS-C sensor, these areas will not be used. Thus, the maximum quality is obtained. Additional post-processing time for the correction of lens errors is therefore not necessary. Olympus E-5, Olympus E-600, Olympus E-450, Olympus E-620, Olympus E-30, Olympus E-520, Olympus E-420, Olympus E-3, Panasonic Lumix DMC-L10, Olympus E-510, Olympus E-410, Leica Digilux 3, Olympus E-400, Panasonic Lumix DMC-L1, Olympus E-330, Olympus E-500, Olympus E-300, Olympus E-1 and any other camera with a 4/3 mount. 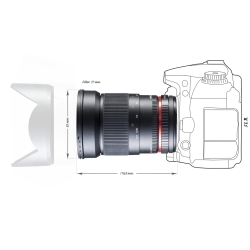 By using an adapter, you can mount the lens on cameras with other mounts as well.